I like to have many options for preparing carrots anyway. They’re readily available all year, they’re one of the only fresh vegetables that are likely to be in good shape even if you’re stuck doing day to day shopping in a convenience store because the good supermarket is too far, they’re cheap, they’re very nutritious… and they do taste good. I started with the two big, chunky carrots – I’m sorry, I probably should have weighed them, but measurements aren’t really all that precise in this recipe… I’d use three or four smaller thinner ones, but to some degree, just use what you have, or what will fit in your pan, or how much you want to serve – this is quite forgiving. 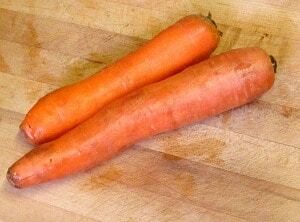 Julienne your carrots. Directions are here, if you’ve ever made carrot sticks it’s the same idea but generally thinner. Start by cutting them in half, or even thirds, across, so the strips are a reasonable length. Take a frying pan (with a cover!) and heat it well. Then add a little olive oil. I used a teaspoon – it spread out well in the hot pan. Add the carrots and toss well to coat in the oil, then cook over high heat for a minute or two, stirring often, to get just the first touch of browning. Then, pour in a teaspoon – yes, just a teaspoon – of vinegar, put the lid on immediately, and turn the heat off under the pan. (If you have an electric stove, move it from the burner.) When the vinegar hits the hot pan, it will immediately go up in steam, and the cover will hold that in with the moisture from the vegetable itself, and the carrots will cook in that steam and the residual heat. 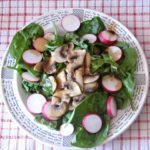 I used wine vinegar, but you may want cider vinegar, depending on what flavor you want, and what else you will serve it with. Let it sit, covered, for about five minutes. That was enough to get these to just the right stage – if you start with younger carrots or want more crunch, you can give it less time, if your carrots have dried out a bit (though these were older, they had not) or if you need it particularly tender, you can give it more time. After the five minutes, I removed the lid – and some steam escaped – tested for tenderness, and stirred the carrots around some more, to be sure they were coated in the oil and vinegar. That is enough for the marinade… The stirring also helps it to start cooling. After it has cooled a while, if you want you may add some minced herbs or other seasoning. 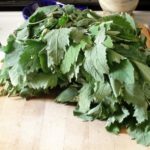 If you add fresh herbs too early they will wilt, so be sure to let it cool first! I minced some fresh dill, two tablespoons, and tossed it in to coat. And add just a sprinkle of salt, if desired. Then refrigerate it to chill it and let it continue to absorb flavor from the marinade. 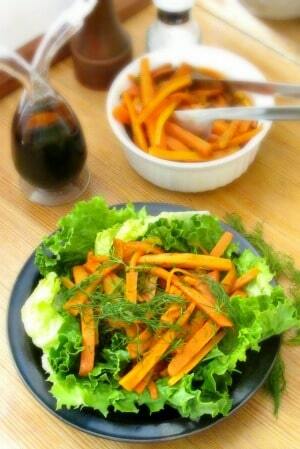 The carrots in the dressing will keep well for several days – it’s a great recipe to make on the weekend to toss into salads all week for interest without having to do any last minute prep. The carrots still have some firmness, some bite, some crispness, so it’s a nice contrast in texture. And if you’re looking for something different (with actual vegetables!) to bring to a barbecue or on a picnic, the tender crisp carrots fill the bill – they won’t wilt or go bad in heat, they have crunch and tang (but milder than pickles) and the bright color just looks nice on a table. 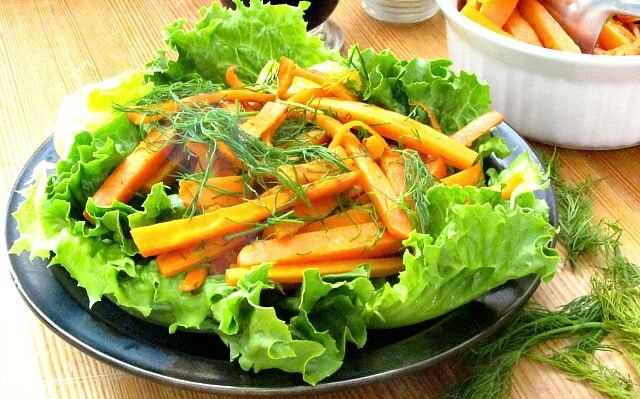 Lightly cooked, tender crisp carrots, marinated for flavor, perfect to add to salads, or alone as a side dish! Heat a fry pan (that has a cover) until it is quite hot, and add the oil. 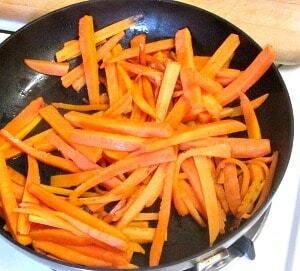 Add the carrots and stir until they are coated with oil. Continue to cook over high heat, stirring frequently, for 2-3 minutes, until just starting to brown slightly. Add vinegar, and immediately cover pan. Remove from heat. Let sit, covered, for about five minutes, allowing the steam and residual heat to cook the carrots. Check for tenderness. When cooked to your taste (remember,the goal is to not fully cook them, but keep some bite) remove the lid, stir to coat with the oil and vinegar, and to start cooling. Let cool about an hour, and then add minced dill, and salt. Refrigerate a few hours to marinate. Thank you! Do try it with the dill - that adds so much flavor! 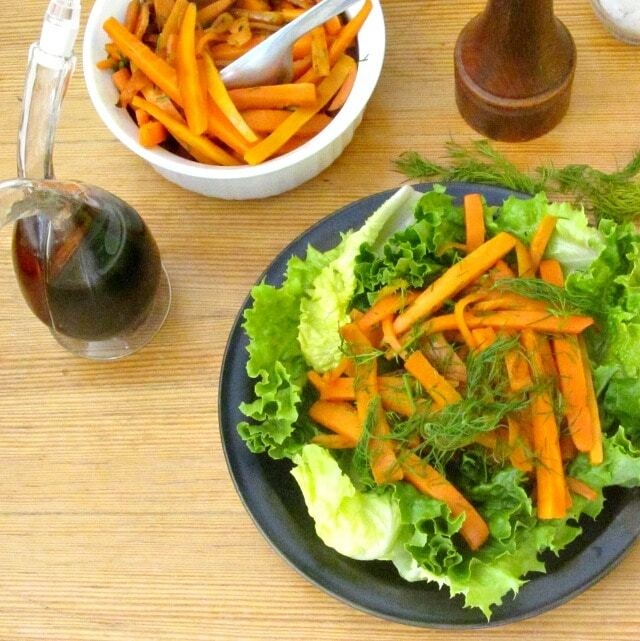 What a great idea for using those woody, older carrots in salads. 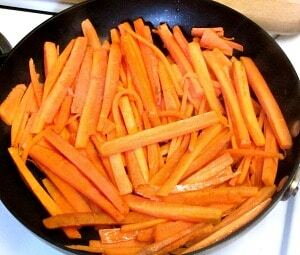 I don't usually cook carrots for salad, but why not? I cook other vegetables. Thanks for the recipe! These are barely cooked - still have some bite to them, but I think they're easier to deal with in a salad. 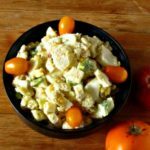 (I'd had one I didn't cut small enough - jawbreaker time... LOL) Yes, we think of salads as raw vegetables, but there's a whole realm of parboiled and/or marinated vegetables - three bean salad, salade composee, giardiniera - which add more complex taste and texture. I want to expand my use of them! 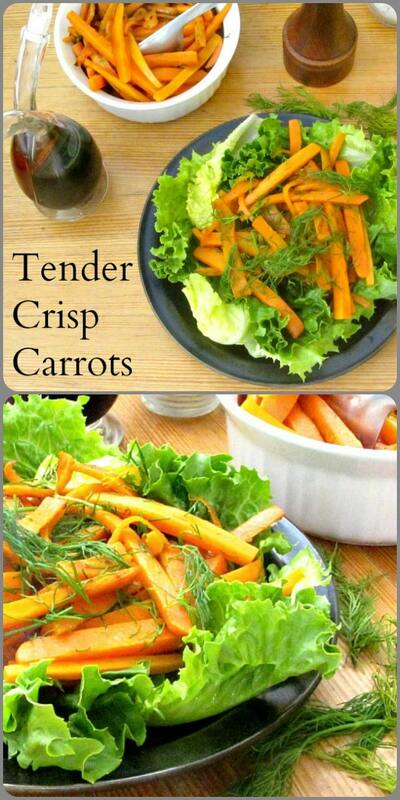 Reminds me of how my mom used to make carrots on the side when I was a kid! Yes, I really like having the variation. Every forkful is a little different... Thank you! I would like to snack on the deliciousness here, seriously. Yum! LOL - yes, I showed it, and spoke about it, as part of a salad - but I just munched on quite a bit of it during the shoot... LOL It's just fine all by itself!